The exterior of Bluebird's six-storey storage facility in Toronto's Leaside neighbourhood resembles a professional office. The potted plants in the atrium lobby have withered, the floors have been stripped to bare concrete and engineers are using ground-penetrating radar to map the supports under the floors. Office cubicles are making way for cubic feet of storage units in a three-storey building on Toronto’s Don Mills Road that was once the home of the National Post newspaper. The renovation of the 1986 building in the suburban Don Mills neighbourhood is one of seven new or repurposed multifloor storage complexes being developed in Toronto and area by Toronto-based Bluebird Self Storage. And it’s only part of a phenomenon in which a flock of Canadian and U.S. developers are building multistorey storage facilities across the fast-growing Greater Toronto Area (GTA), which is perceived as underserviced for storage space, says Clive Bradley, self-storage group practice lead for CBRE Ltd. 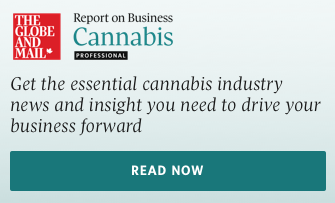 The two big areas of demand in Canada are the Toronto and Vancouver areas. Calgary and Edmonton are also seeing renewed interest as oil prices recover. Consolidation of smaller players is accelerating as self-storage has become more attractive as an investment, he adds. Real estate investment trusts (REITs) have already acquired many portfolios of medium-sized storage operators and now are working on buying up so called “mom and pop operations,” which may include just one or two individually owned storage sites. In addition to Bluebird, U.S. players making acquisitions include StorageMart, Public Storage and Smart Store. Lockers at the Leaside facility look alike from the outside but colours on the edge of the linoleum floor aid navigation through the maze. 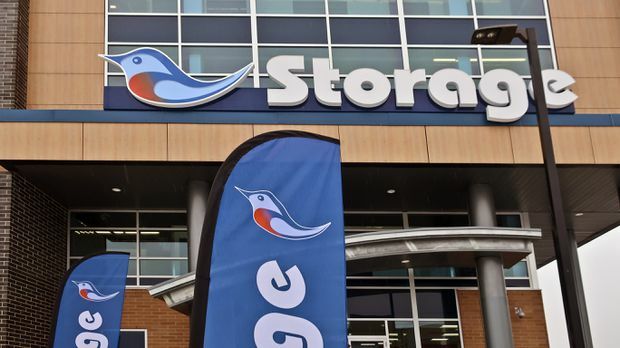 Major Canadian companies include Access Self Storage, with 140 locations, and publicly traded StorageVault Canada Inc., which has grown to more than 100 locations across Canada, mostly by acquisition rather than development. Regional players include Aurora Ont.-based Apple Self Storage, with locations in Ontario and the Maritimes, and Green Storage, which promotes eco-conscious facilities in Ontario that feature LED lighting, solar panels and extra insulation. Ottawa-based Dymon Storage has announced an aggressive goal of building as many as 80 new facilities across the GTA over the next 10 years. As storage competes for prime development sites, Dymon has been getting creative. In January, Dymon announced a plan for a nine-storey mixed-use development featuring self-storage, office and retail space at 850 York Mills in Toronto. Plans call for the nine-storey structure, designed by Tact Architecture, to have 58 per cent of the total floor area devoted to storage. The project is similar to another multiuse development proposal near the intersection of Dufferin Street and Wilson Avenue that Dymon announced in 2018. New developments are moving away from the stereotype of garage-style units. 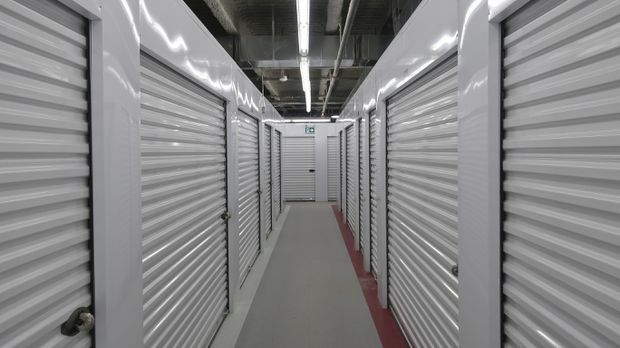 “The trend has been that women are the ones most likely to use self -storage and that’s why they want to make sure they’re clean and well-lit, with staff on site to help out, so that women feel safe. That’s a change from old-style facilities that felt like rows of tin sheds in industrial areas. There’s still a demand for that sort of thing, but it’s more for storage of contractors’ supplies,” Mr. Bradley notes. Jon Dorman, Bluebird’s managing director for global development, surveys the lobby of the former National Post building in Toronto's Don Mills suburb. The building is being renovated into a three-storey storage facility. At 150,000 square feet, it’s not the largest self-storage facility in the GTA, but the company expects to be able to charge premium rates because of its location, he adds. The site is four and a half acres, with two acres of parking and vacant land in the rear of the building. The land could eventually be built out with one-storey garage-style storage units “or we could sell part of the parcel to another developer,” he says. However, low-rise storage will be an anomaly in the future in Toronto. A six-storey Bluebird new-build in Toronto’s Leaside neighbourhood that opened in January has a total of 135,000 square feet and 1,100 units consisting of metal-walled enclosures with roll up doors in a range of configurations. Bluebird now aims to build about five storage facilities annually in Canada in addition to acquistions, Mr. DeCurtins says. The site planners are looking across the country identifying hot spots in the Montreal and Vancouver areas, Calgary, and Edmonton. “But six of the 12 largest cities in the country are in the Toronto region. We could just continue to expand in the extended GTA, including Hamilton, St. Catharines and Niagara and not run out of potential,” Mr. DeCurtins says. A new partnership with Buffalo-based Life Storage Inc. to co-manage properties gives Bluebird more leverage for investing in new properties, he notes. Bluebird’s self-storage facilities in the GTA will be branded as Bluebird but co-managed by Life Storage, in partnership with private-equity real estate investment firm NYX Capital Corp., which also manages several self-storage facilities in the portfolio of Bluebird’s U.S. parent company, Tampa-based Budget Development Partners. The first phase of the Don Mills conversion is expected to open at the end of 2019 and be fully open in the spring of 2020. New duct work and shipping elevators large enough to fit sofas inside are being installed in the former atrium, avoiding the need to cut into floors, says Jon Dorman, Bluebird’s managing director for global development. A big investment will be installing completely new heating and air conditioning equipment to replace the current 30-year-old system. “All our buildings are climate-controlled. Air conditioning is important because it significantly reduces the humidity in the summer,” Mr. Dorman says. The cost of storage depends on the value of real estate in the location. Most contracts are month to month. A Bluebird 10-foot by 10-foot unit in established neighbourhood Leaside, for instance, costs $352 a month, and that would add up to $4,225 for 100 square feet for a year. The rent for a similar-sized unit in a more suburban location might be significantly less. Dymon's planned storage facility on Dufferin Street in Toronto is expected to feature office and retail space as well as self-storage. Estimate of current self-storage facilities across Canada. Self-storage space in Canada per capita. U.S. per capita self-storage space in the 25 largest markets; an average of seven square feet a person nationally. Average storage unit vacancy rate in the Greater Toronto Area, a historic low. Percentage of self-storage tenants who are residential users.